These words are simple yet they move us toward significant meaning and memories. Words carry a weight of influence upon us; they direct us toward what to believe and how to behave. This message will remind us that simple words have powerful meaning for life and we must take them seriously. Death was a stunning word and reality for these Thessalonians. Paul continues his instructions from 4:1 (authoritative military orders) in speaking about a Christian perspective of death. Apparently, they had questions or concerns about those who died and the after-life. Paul writes to clarify and educate so that there is no grief. Throughout this letter, Paul offers hints on the meaning of the gospel of Christ’s death and resurrection and why this is the basis for hope after death. 4:14 “Jesus died…” what is the reason? An underlying theme through this letter is that there is a wrath to suffer for those who do not trust in Jesus Christ, as well as the reality that this suffering wrath was somehow experienced in Jesus’ death. To understand a proper perspective on death you must understand God’s wrath and how it was displayed in the death of Jesus. JESUS DIED (1 Thess 4:13-14). Paul writes to these believers so they will not be uninformed. In a sense, all of Scripture is written so that we would be informed and even more, inspired to know and trust Jesus. He affirms that death brings a grief like no other circumstance in life. Paul is not saying that Christians do not grieve in death. No, being a Christian does not mean you are spared emotional highs and lows, sadness, sorrow and setbacks. However, Paul is saying the contrast is determined by the destination after death. The destination for the unbeliever is hell leaving no hope, whereas the destination for the believer is “with Jesus” offering much hope. Your eternal destination is determined by your belief in Jesus. The Bible says that Jesus died. What exactly does this mean? To understand the significance of Jesus’ death we must understand Jesus’ identity. This is the most debated subject in all of history, yet it is the most substantiated from historical records. A simple reading of the Gospels tells us that Jesus is the Son of God, sent to reveal God the Father (John 1:14) and take away the sin of the world (John 1:29). Even more explicit is his own claim that he is “the way and the truth and the life. No one comes to the Father except through me” (John 14:6). Was Jesus a Lunatic? Jesus’ claim to be God could have been a mistake or case of insanity. Was Jesus a Liar? Jesus’ claim to be God intentionally misled people about his identity and salvation. Was Jesus Lord? Jesus’ claim to be the Christ, the Son of God is true, therefore to reject him is to reject God. This is only half of Paul’s statement. After understanding Jesus’ identity it is even more profound to grasp that He died. Paul instructs the Thessalonians for those who fall asleep that have believed in Jesus’ death they will rise and be “in Him”. Paul uses significant word choices contrasting the believers as “sleeping” but Jesus “died”. Paul’s intention is to show that Jesus fully endured the horrors of death, the wages of sin only to conquer it through His resurrection and thus transforming death for his followers into sleep. A fuller picture of Jesus dying is seen in the biblical word “crucifixion”. The events of this historical happening are recorded in each of the Gospels. Crucifixion was the most painful mode of execution reserved for the most despised criminals. Jews viewed crucifixion as being under God’s curse. The agony of crucifixion is due to the fact of its prolonged means of death. Those crucified would often hang on a cross for days, passing in and out of consciousness as their lungs struggled to breathe, while laboring under the weight of their dying body. 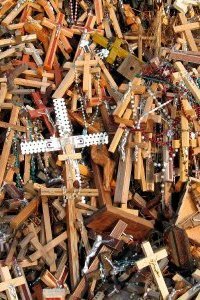 Due to the fact that timber was so e xpensive, the wood of the cross was typically recycled wood, therefore layered with the blood and sweat of many others. After this scourging, there was placed on Jesus head crown of thorns. Long thorns that would pierce into his forehead, ears, brow and even skull. He rose again calling us to believe in Him. The gospel has happened for you, has it happened to you? By trusting in Jesus’ blood sacrificial death on the cross you can be forgiven and made righteous. For a greater study of this subject see 50 Reasons Jesus Came to Die by John Piper or Death by Love by Mark Driscoll. A couple of resources on this subject are The Case for Christ by Lee Strobel and Jesus, More Than A Carpenter by Josh McDowell. Morris, L. (1984). Vol. 13: 1 and 2 Thessalonians: An introduction and commentary. Tyndale New Testament Commentaries (88). Downers Grove, IL: InterVarsity Press. Much of the following information on crucifixion comes from Driscoll’s Death by Love pp 17-34 and John Stott’s The Cross of Christ.